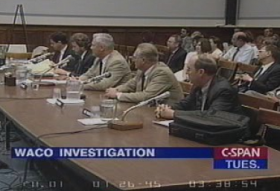 In interviews conducted for the Justice Department’s probe of the FBI’s 51-day siege of the Branch Davidian compound (see October 8, 1993), several FBI agents present during the siege and/or final assault say the bureau abandoned negotiations much too early and instead implemented aggressive measures that were counterproductive (see March 23, 1993). The interviews will not be included in the Justice Department’s report, and will not be released until December 1999, when they are made available to the special counsel investigating the FBI’s conduct during the final assault (see September 7-8, 1999). Negotiators Submitted Own Plan for Tear-Gas Assault - Noesner says that on March 22, he and other negotiators submitted their own plan for gassing the compound, in hopes that their more moderated plan would be chosen over a more aggressive plan from the Hostage Rescue Team (HRT). “This showed a clear realization… that the negotiations were basically over. They knew they were at an impasse,” Noesner says of FBI negotiators. “They recommended that tear gas be used because they realized this was going to happen anyway and they wanted to control it, to use it with leverage in the negotiations. The tactical interests just wanted to throw the gas in.” The negotiators’ plan became the blueprint for the plan accepted by Attorney General Janet Reno. “It would be allowed to work by letting them sit in it. The idea was to increase pressure but not in a way to provoke a violent response,” Noesner says.